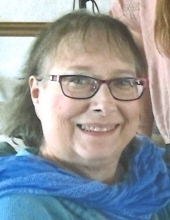 CONRAD, Carol, 63, born March 28, 1955 to Dana and Lillian Hammer of Royal Oak, died September 10, 2018. She is the beloved mother of four sons: David, Thomas, Joseph and Michael, and beloved grandmother to Michaela and Chase. Carol is survived by her three sisters: Judith, Patricia and Diane (Larry). Carol served her country in the U.S. Air Force as an Airman, and she served her family by the valor in which she endured her long illness. Wherever her illness took her, she made friends of those who cared for her or shared her room. A viewing will be held at Sharp Funeral Home 209 E. Broad Street Linden MI 48451 on Wednesday, September 12th from 6 to 8 P.M., and Thursday, September 13th from 4 to 7 P.M., with a Memorial Service from 7 to 8. Memorial Contributions can be made to the National Kidney Foundation or Adopt-A-Pet of Fenton, MI. To send flowers or a remembrance gift to the family of Carol Jean Conrad, please visit our Tribute Store. "Email Address" would like to share the life celebration of Carol Jean Conrad. Click on the "link" to go to share a favorite memory or leave a condolence message for the family.